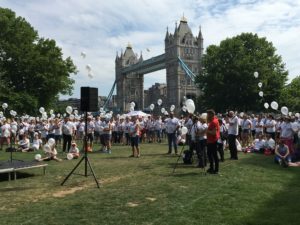 On Saturday July 9, over 1,200 walkers congregated in London’s Potters Fields Park for CRY’s annual Heart of London Bridges walk – and, for the 11th year running, Team Trinity was delighted to be at the start line, meeting a huge number of inspiring families coming together in memory of a young life lost to cardiac problems. From 8am, members of the CRY team, as well as an army of wonderful and enthusiastic volunteers, arrived at the start venue to set up the marquees, press tent and bold CRY signage as well as being on hand to meet and greet the walkers. As in all previous years, many of the families who had signed up for CRY’s flagship event were (with the help of CRY Press Team and our official photographer) keen to make contact with their local media to “tell their story” in a bid to help raise awareness of CRY and the work we do. And, as ever, it was one of the most humbling events in CRY’s busy calendar of raising funds and awareness. Set against the iconic backdrop of Tower Bridge, it was incredibly moving to be with so many people preparing to walk in memory of a friend or family member. It was particularly poignant to be able to provide an opportunity for many longstanding CRY supporters to meet up with others who had been similarly affected by young sudden cardiac death – some of whom had been travelling to London to take part in the event since its launch in 2007. Walkers came in groups – large and small – whilst others chose to walk on their own or as a couple. The largest group that took part this year was made up of over 100 friends, colleagues and family members of Jemima Wilson from Guildford, Surrey who died suddenly just over a year ago in July 2016, aged just 28. 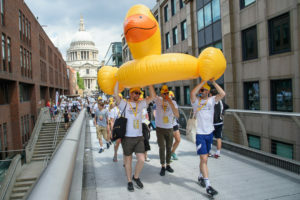 The Puddleducks (pictured) made quite a splash as they donned “beaks” and took it in turns to carry an enormous inflatable duck around the 8k course! There were lots of smiles as well as tears. Ahead of a minute’s silence, CRY Patron, stage actor and Hollywood star, Vincent Regan addressed the crowd, before leading the Walk, alongside The Fell family from his native North Yorkshire. “Every week in the UK, 12 young people (aged 14-35) die suddenly from undiagnosed heart conditions. I know from a personal perspective the pain and devastation this can cause, having been approached by a family who live close to my home in the North East, following the tragic loss of their son Josh, aged just 15. To date, around £800,000 has been raised by this event alone – so let’s keep on stepping up to this annual challenge and walk together to stop young sudden cardiac death.